We're back again to bring you the top five tech news stories currently breaking across the internet, all written up courtesy of our friends at TechRadar, and it's a tasty batch today – we've got reports on BlackBerry, Google, Ikea (and Sonos) and Amazon, so dig right in. You don't see many phones with a physical keyboard these days, but they were the norm when BlackBerry ruled the mobile world. 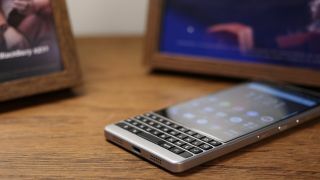 BlackBerry Mobile is back with the Key2, a successor to last year's Key One, and it brings with it an improved keyboard to tap away on, some neat extra security features, and a dual-lens rear camera around the back. From a freshly launched smartphone to one we're still expecting: the Pixel 3 XL. New pictures have leaked out on the web that show the upcoming Google flagship from all angles – you can see the design remains largely the same as last year, only this time around there's a notch on the front of the display. It should launch sometime in October. Check out one of the SYMFONISK smart speaker range, a project from Ikea in partnership with Sonos. The idea is that you get all that smart speaker goodness packed into designs that are functional and fit in with your existing furniture – like this particular model that works as a shelf too. Apparently these devices will be hitting stores at some point in 2019. Amazon has another inexpensive video-streaming box that it wants you to plug into your television set, and it's called the Amazon Fire TV Cube. It's a direct rival to the Chromecast and the Apple TV, and it comes with Alexa on board. The device also comes with its own speaker, so you can use it like a normal Amazon Echo as well as a media streaming box. We're expecting Android P to officially roll out later this year, but in the meantime, Google has pushed out 157 new emojis to the beta version of the software (currently being trialled by those brave enough to install it). Included in the new batch, we've got some properly cooked bacon, a llama, a bagel, a face with three hearts, and – at last – redheaded emoji.